There is a tension, peculiar to basketball, between the interests of the team and the interests of the individual. The game continually tempts the people who play it to do things that are not in the interest of the group. On the baseball field, it would be hard for a player to sacrifice his team’s interest for his own. Baseball is an individual sport masquerading as a team one: by doing what’s best for himself, the player nearly always also does what is best for his team. I first read Moneyball when I lived in Colorado in 2004. This book, authored by Michael Lewis, completely changed the way I view baseball and its front offices. It is another reason I don’t call myself a Yankee fan anymore. Quite simply, Lewis researched why money alone doesn’t win championships and how certain general managers are rethinking the game’s statistics toward maximizing their lineups. One of these general managers was the Oakland A's Billy Beane. 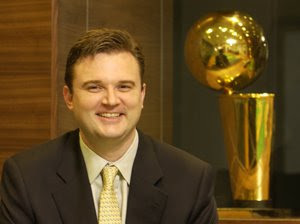 His basketball counterpart, as Lewis writes in a recent New York Times Magazine piece, is Daryl Morey, 33, of the Houston Rockets. Morey was part of the reason the Rockets won 22 straight games last season without their two stars, Tracy McGrady and Yao Ming, on the court at the same time during 11 of those wins. He was the main reason, however, Shane Battier played in every game during that winning streak. He also was the reason why they traded for Battier in the first place. Battier is exactly the player a team like the Rockets want, a true undervalued player because he doesn’t score points or grab rebounds or produce any other statistic that most players think they get paid for. Battier does one thing, though, as well as the other All-Star players in the NBA: he makes his team win. When (Kobe) Bryant is in the game and Battier is on him, the Lakers’ offense is worse than if the N.B.A. 's best player had taken the night off. 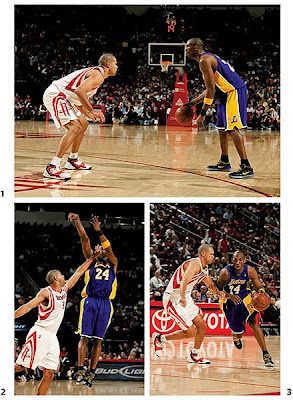 In the game Lewis watched between the Houston Rockets and the L.A. Lakers, Battier guarded the Laker's star Kobe Bryant the entire game. Bryant outscored Battier 33 to 3. Without Battier, says Sam Hinkie to Lewis, the Rockets would have lost by 12. Hinkie is the vice president of player operations and the head of basketball analytics in the Rockets’ front office. Battier played the odds the entire game, forcing Bryant into taking his most inefficient shots on the court. With the Rockets leading by two in the closing seconds, Bryant took a shot 27.4 feet from the hoop. Bryant had missed 86.3 percent of his shots from farther than 26.75 feet from the basket in the closing seconds. Battier and the Rockets front office knew this. Yet Bryant made the shot and the Lakers won. Most fans would think it was typical Kobe being Kobe, when in fact it was a very rare occurrence. In the long-run, over the course of a season, however, you can’t beat the odds. One statistical rule of thumb in basketball is that a team leading by more points than there are minutes left near the end of the game has an 80 percent chance of winning. Lewis points out that two of three NBA games are decided by fewer than 6 points. That is two or three possessions. It is a couple of turnovers. It is the reason why you may see more teams following Morey’s method and acquiring players like Shane Battier. It won't stop there. In the current recession spending money efficiently is a top priority for most professional teams. Computer geeks who love sports and business are going to continue to revolutionize how professional teams choose their players. Moneyball is no longer just for baseball. When he builds in the Hollywood Hills or Beverly Hills, Mr. Herman says he is [url=http://posterous.com/people/4woR9hRUvDod]as workaday[/url] restricted to a unsatisfactory lot. This scads measures to three-and-a-half acres and gave him the leeway he needed to engender a familiar with featuring walls of glass. When he builds in the Hollywood Hills or Beverly Hills, Mr. Herman says he is [url=http://posterous.com/people/4woR9ioR77ot]as old[/url] restricted to a unsatisfactory lot. This destiny measures damn near three-and-a-half acres and gave him the elbow-room he needed to engender a bailiwick featuring walls of glass.